Black and white designs evoke images of luxurious black tie affairs with champagne and caviar. 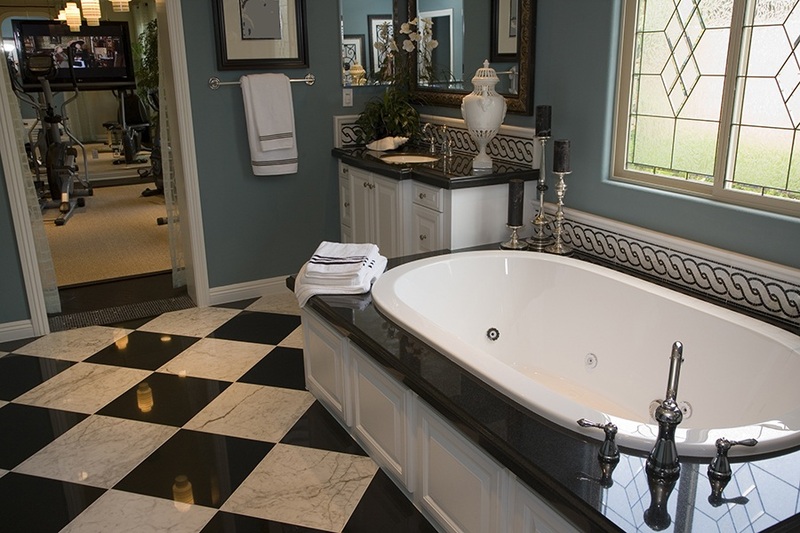 Elegant black and white tile designs may be timeless and classic, but they have also been revamped for modern tastes. While everyone is familiar with simple checkerboard patterns from the past, newer, more modern, designs tend to be intricate, subtler, and with a whole lot more curves. 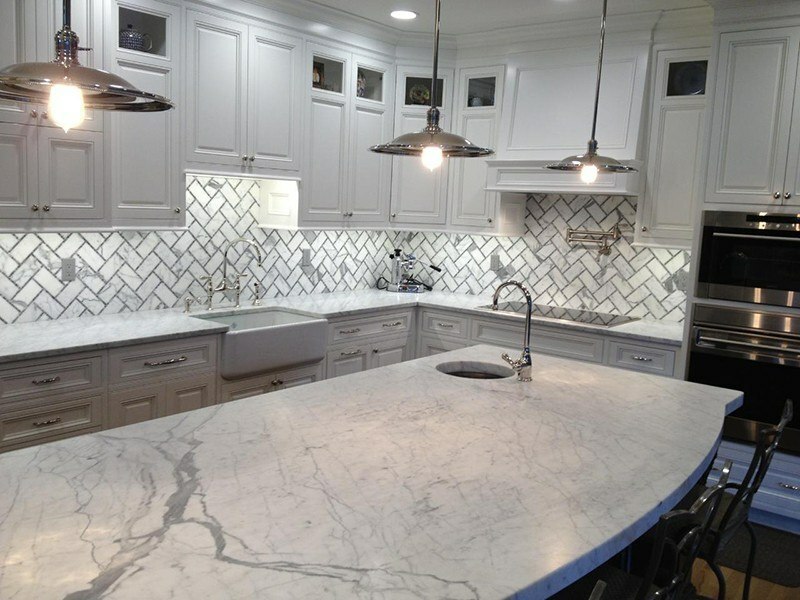 Even patterns that are classic like herringbone and basketweave have been upgraded with the use of marble to make them far more dramatic than old ceramic tile designs. 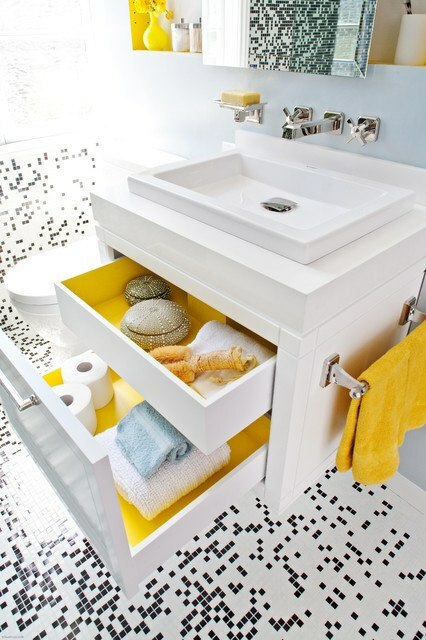 Take a look at how we took outdated black and white tile ideas and made them into something new and vibrant! The typical checkerboard pattern is comprised of 12x12 tiles creates a large visual impact, but this vintage design can be elevated to a new modern standard. The way to modernize it is to make the squares smaller and more complex. Take a look at this Chex Collection checker board pattern that has an almost hypnotizing effect in black and white. Now imagine the black and white chex not just in a checkerboard pattern, and you get this futuristic almost digital floor. or this Cirus tile, both of which make divine flooring options that are elegant and modern at the same time. 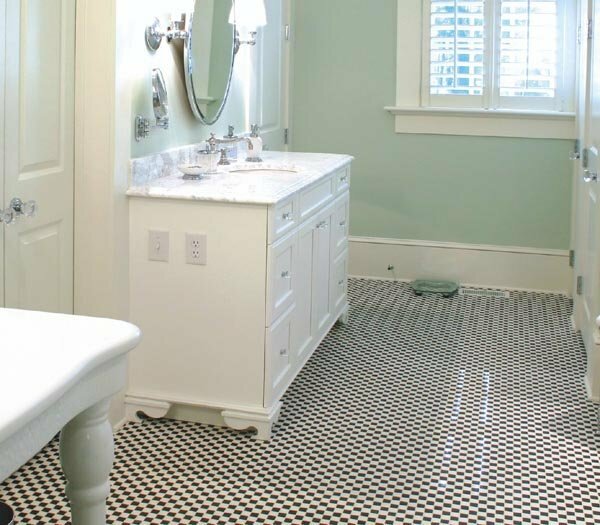 When you take a black and white tile and then use it to cover a bathroom floor, like this Anner bathroom floor, they become dramatic focal points that enliven a small room. Murals, in the past, also tended to be very colorful affairs, but there is no reason you can't have a black and white mural. The modern design movement of the 1950's used monochromatic schemes to simplify the color palette to this day black and white has always been a color scheme associated with elegance and luxury. Black and white is so in vogue in 2018 that it is even popular in black and white weddings complete with a black and white wedding cake. 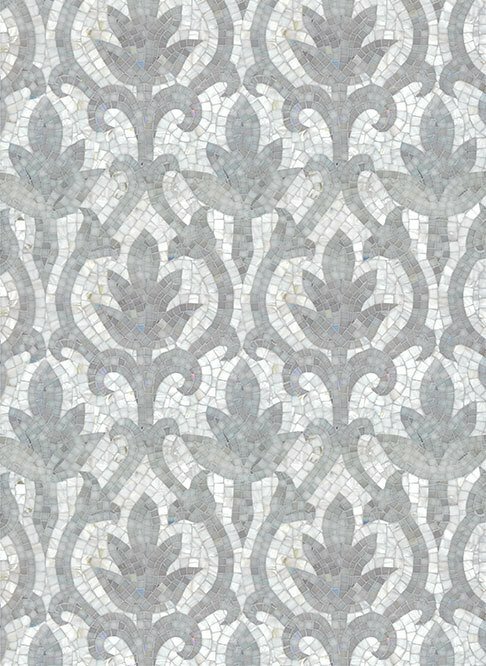 Imagine using this armol mosaic tile to create a beautiful black and white backdrop in a bath, a dining room, or even sitting area. Modern borders can be as classic as wave patterns in black and white to something more whimsical or abstract. 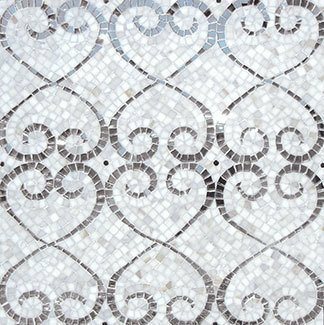 This mosaic circle design gets the best of both worlds evoking an ancient mosaic with miniature pieces of stone while creating a completely modern abstract design. To add a little glimmer, consider using black and white tiles with innovative materials, like mirrors or mother-of-pearl. 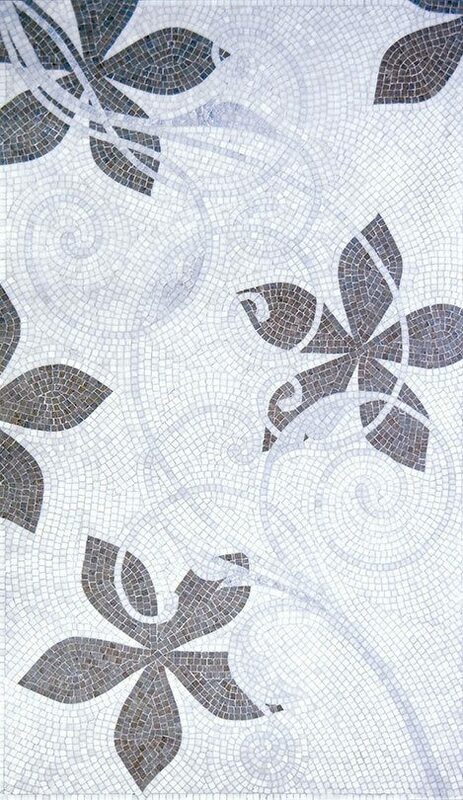 The Glitz tile collection offers many different patterns, including this Viven tile, in black and white with mirror and stone pieces making up the tile design. The La Perla collection uses mother-of-pearl to create the shimmery effect with stone mosaics. 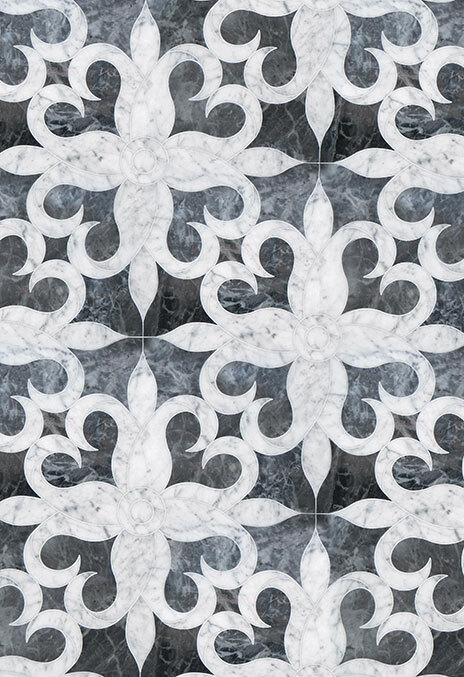 Here is the Munna tile from the La Perla collection to give you an idea how this type of tile can create soft hues that capture and reflect light in a sharp black and white design. If you fancy a herringbone pattern, but want to upgrade it to modern tastes, the answer is marble. 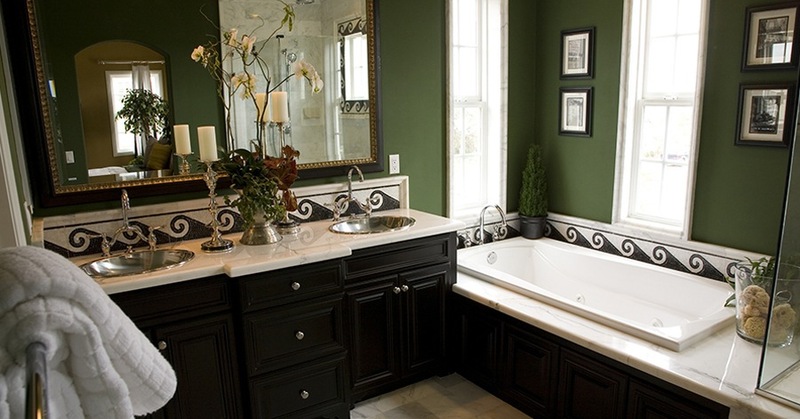 Marble is black and white, but naturally evokes luxury in the bath or kitchen. 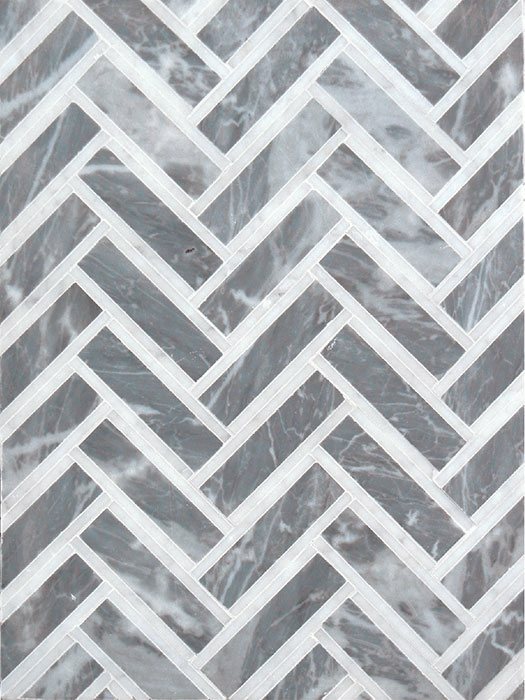 Here is one design that show how a herringbone pattern in marble looks ultra sleek and modern. This could look even more daring if the subway tile was in dark marble with a white border, as in this Alchof tile. The same way a herringbone pattern is upgraded with marble, you can do with any classic design, like the basketweave ceramic tiles. Here you can see a super elegant bathroom with a basketweave floor design done entirely in black and white carrara marble. 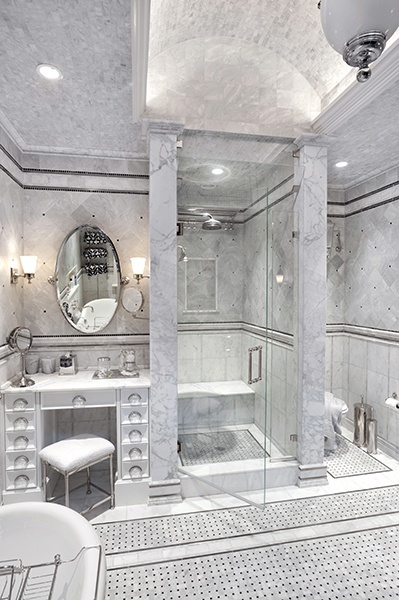 It doesn't get more luxurious than that! The trick to a modern design that is appealing in black and white is to make it daring. Vintage black and white designs relied on calm, almost boring, patterns, but modern tastes want something with much more visual interest. 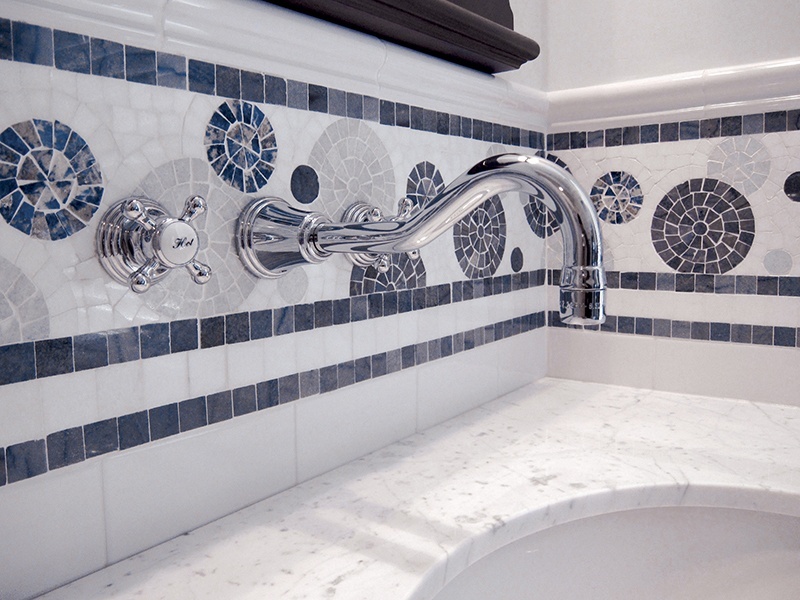 You can do that by creating new, never-before-done, innovative, designs or just by using marble and newer technologies, like the water jet, to create more intricate or abstract designs. Going for an abstract look whether in a mural or border tile in black and white is also very modern and appropriate for contemporary tastes. You can get inspiration for black and white themed murals from old black and white photographs or even old Hollywood films. 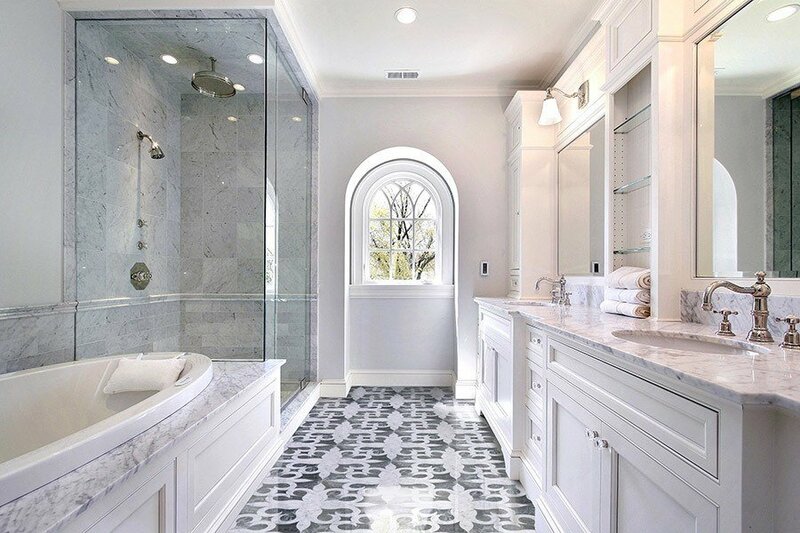 Just remember, people may still adore the simple black and white color schemes of the 1950s designs, but they want there to be much more visual interest with curves and additional design elements like mirrored or mother-of-pearl tiles. 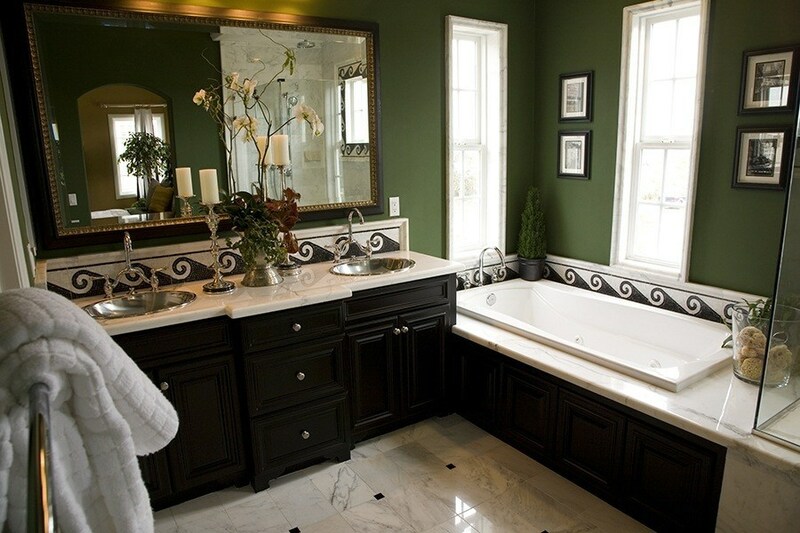 Also, using marble is one sure way to make a simple black and white design extremely elegant instantly. 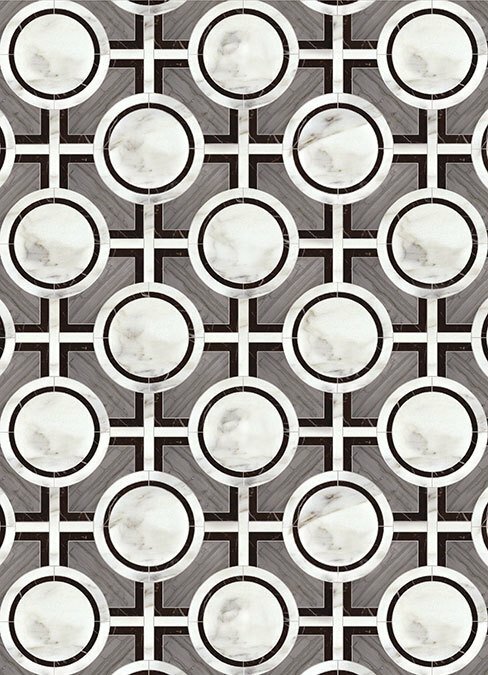 If you have questions about this blog post or how to incorporate black and white tile designs into your next project, please comment below.